Hello!! Yes, I am pretty excited that the day has finally come to reveal my very first stamp sets!! I'm delighted to have three stamp sets in this release with The Craft's Meow, a total of six new stamp sets will be released on August 21st!! I am so thankful to Lisa for giving me the opportunity to illustrate for her. Today the design team are previewing Potted Garden and Cottage Garden. 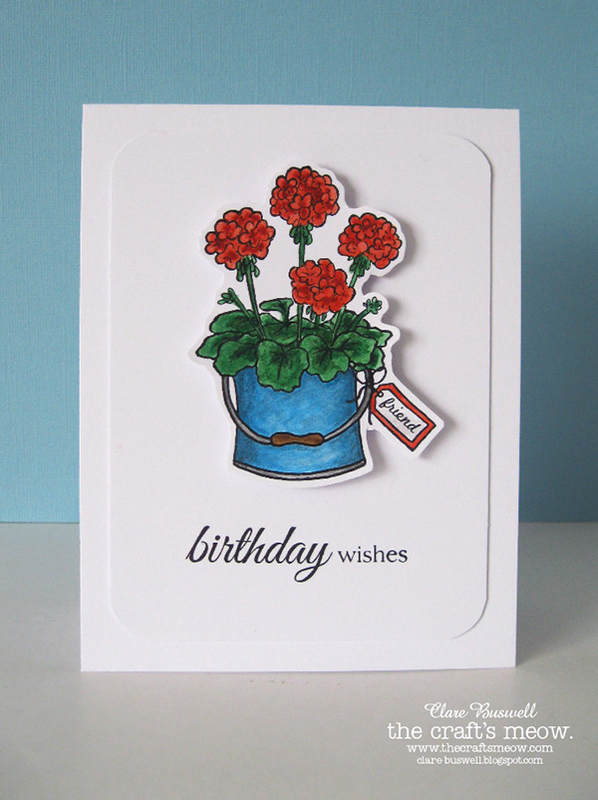 Potted Garden is a 6x4 stamp set featuring two different illustrated container pots, one with tulips and one with geraniums. 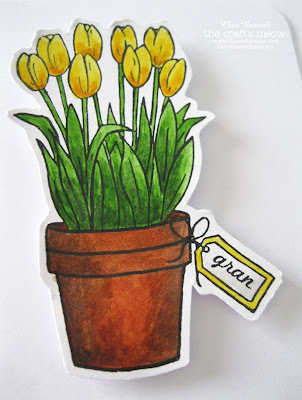 These were two of my gran's favorite flowers and mine too! 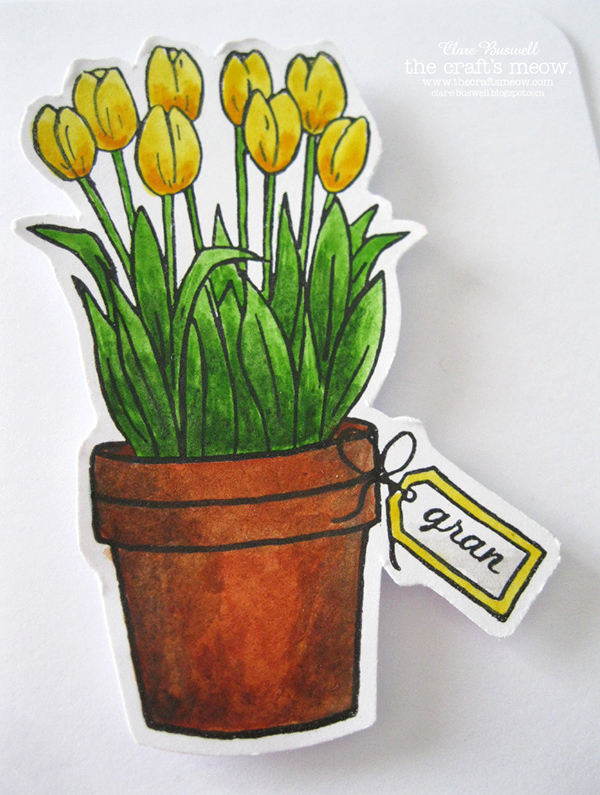 The little tag is stamped separately and there are ten different options to stamp in the tag, including gran, nana, mom, mum, aunt, niece, sister, friend, xoxo and a little heart. Along with this there are five sentiments, ones I would find the most useful myself. Size was an important factor when I was designing this set, I wanted the flowers to be large enough to be a good focal point on a card while still making the sentiments a decent size also. I'm not mad about little sentiments and I just love the font combo here! I colored both images using acrylic paints, fussy cut them and popped them onto my card with foam pads. I kept the design pretty CAS today so you could clearly see the illustrations. 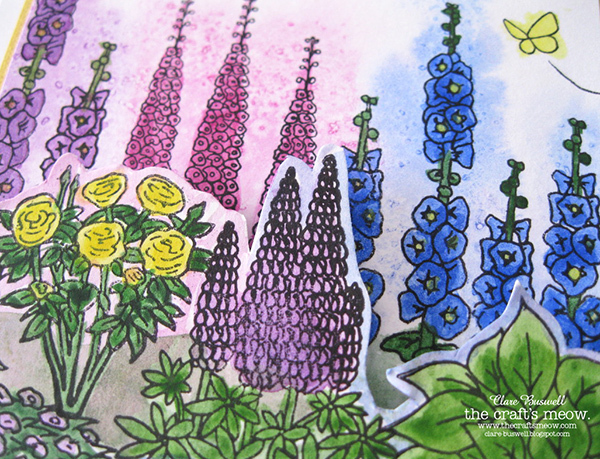 Next up is Cottage Garden. An 8x6 stamp set and I have to say it is jam packed!! This set took me ages to put together, as you might have guessed already I love attention to detail! I love progressing a design in my sketchbook, each element in this set was sketched by hand in various forms until it was just right! The concept of the set is a garden scene builder, there are numerous elements from a cottage garden that you can stamp together to create your own little border scene in your imaginary garden! If you don't already know I love gardening, so I was dying to create this set! There is a wide selection of plants and flowers in this set, including those that would sit at the front, middle and back of the border. 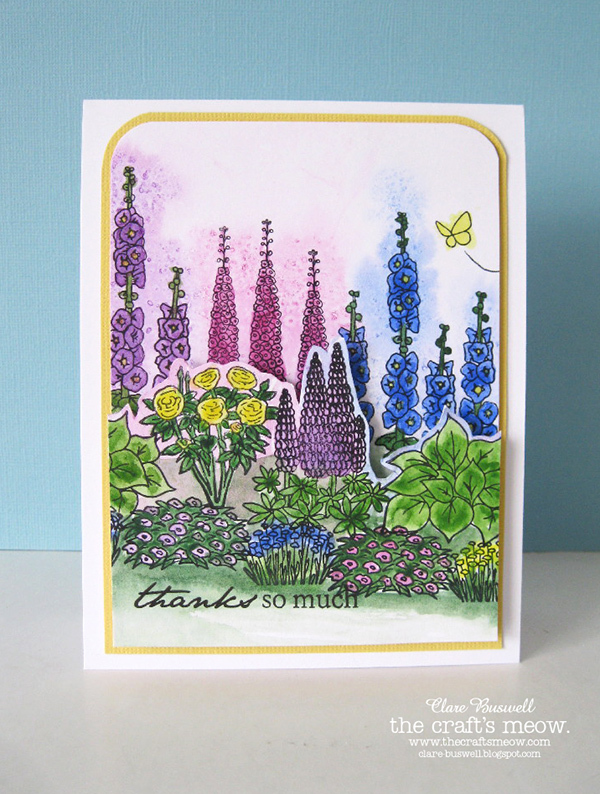 These include roses, hostas, lupins, hollyhocks, delphiniums, alliums, lavender, cosmos and a few more! 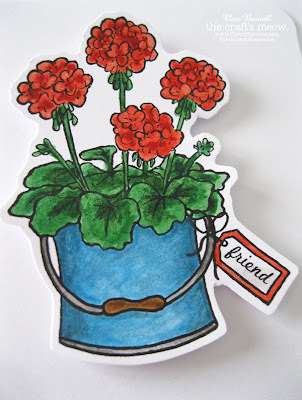 Here I stamped a selection on watercolor paper and colored with watercolors. 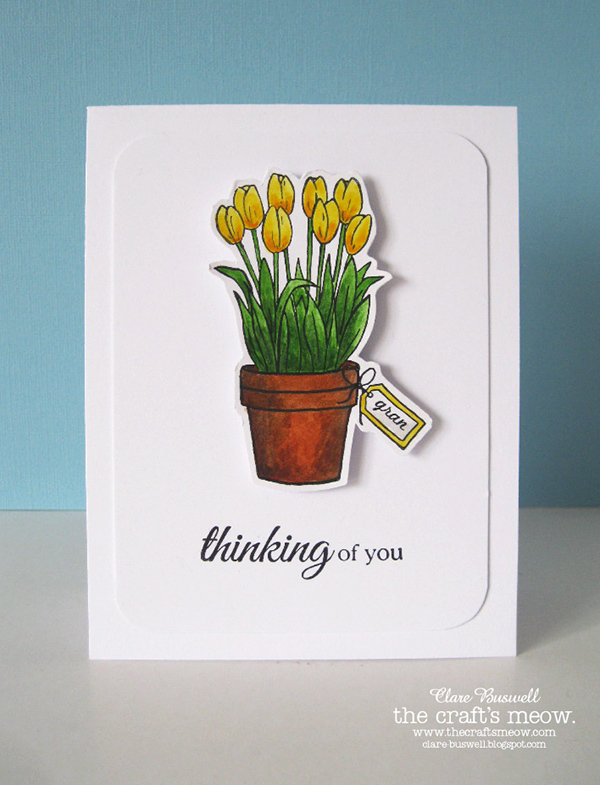 I chose a romantic font to compliment this set, there are seven sentiments altogether for a range of occasions. I like a lot of useful sentiments!! For my second card using this set I went for a more layered look using a watercolor effect. I love that there are SO many different possible combinations with the various elements in this set. I wish I had more time to play with it!! 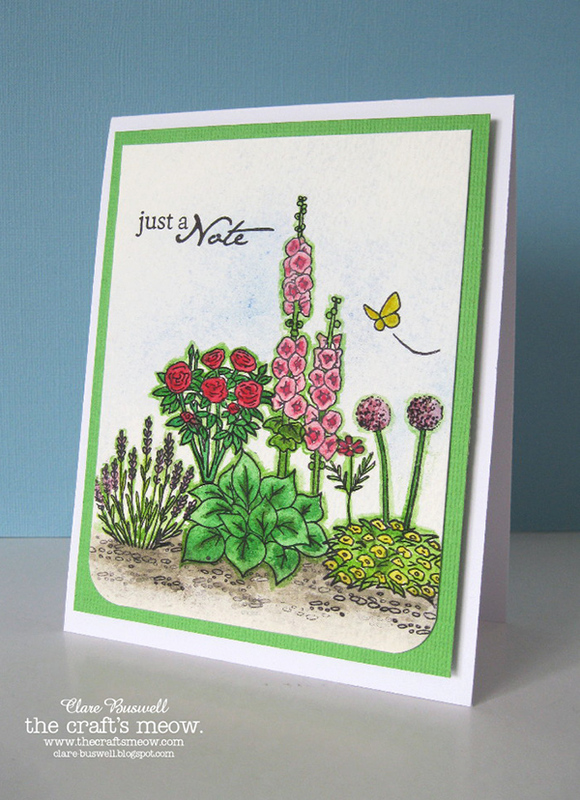 There's also a butterfly and a dragonfly stamp in this set, I love to add a touch of life to bring a scene alive. The watercolor background I created by wetting the cardstock first, then adding some subtle color and a sprinkling of salt. Once dry I stamped the flowers over this background and colored with watercolors. 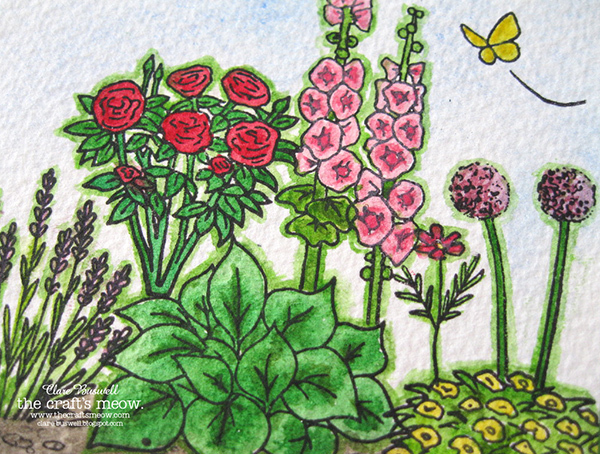 To add some more dimension I added a second layer of flowers to add some more depth to the border. There's also a wrought iron bench stamp in this set along with some gravel stamps to add texture to the ground but here I chose to add a grassy front. Don't forget to visit the rest of the DT's blogs, they did an amazing job with these sets and I have to say it's absolutely magic to see these talented card-makers create using my stamp designs! I'm so grateful! 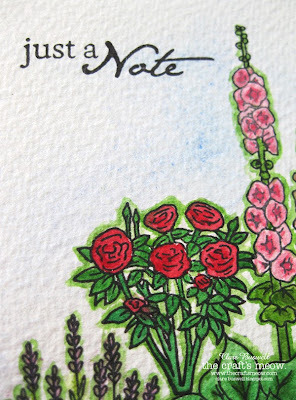 My third stamp set is being previewed on August 20th and it's a totally different subject matter! 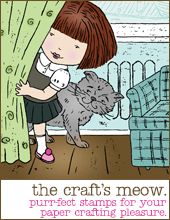 I'll be back tomorrow with the rest of the team previewing Angelica's first stamp set with The Craft's Meow! 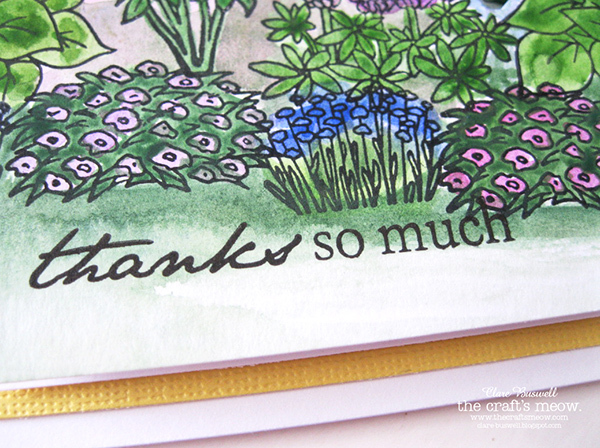 Thanks for dropping by and I hope you enjoyed your first glimpse at my stamp designs, they truly are a reflection of me! Oh and you have a chance to WIN both these new sets, just leave a comment on The Craft's Meow blog by 8:00pm Pacific tonight! Good luck! Clare, thank you so much for these beautiful sets! I had such fun playing with them, and I know they'll be favorites of mine going forward. You thought of everything - well done! Cannot wait to see what you'll have for us going forward! 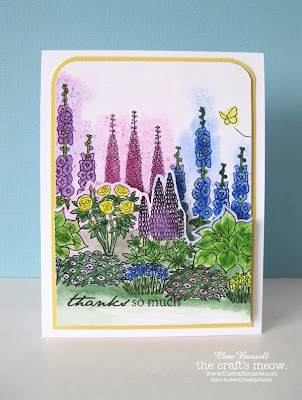 These are such pretty stamp sets Clare! I have enjoyed creating with them and love your style. Looking forward to seeing what else you have coming in the future for TCM and its' fans!! Congratulations on your first release and they are beautiful sets. I really like how you can group and arrange them. I like how you used acrylics and water colors...you did a beautiful job. Also very cool there will be lots of sentiments. Super job. they are so beautiful. I can picture a child with their gram walking through the garden. The child would be looking at her gram adoringly, as gram explained what was what in the garden. Wouldn't that be sweet? 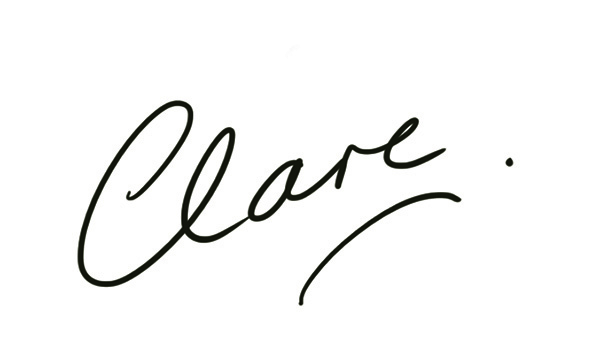 Wow Clare! your own stamp designs! How super cool - what wonderful garden/flower designs!! I cannot tell you how much I adore these images, Clare! So excited to get to play with your designs, and your projects today showcase them beautifully! Congratulations, love!